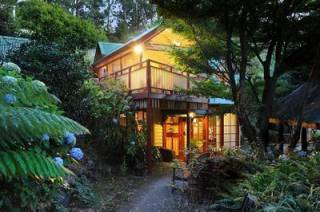 Misty Wood Retreat on the edge of a forest in Olinda. Newly renovated, contemporary and fresh this peaceful retreat welcomes lovers, friends and families near Olinda Village. 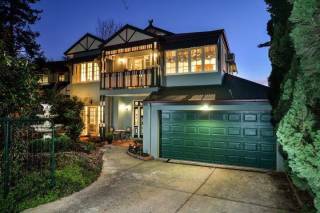 Overlooking the forest, there are views into the trees and over the spreading Melbourne suburbs with lovely sunsets through the filter of the tree canopy. 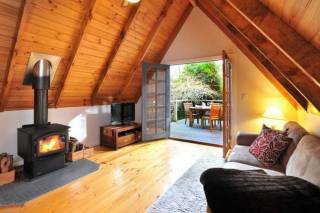 Misty Woods Retreat offers guests an upstairs single level lounge/dining/kitchen area. The master bedroom with its queen bed is here as is a bath room. The lovely oval bath looks out to the forest through little romantic candles a place to dream and relax. There is a separate shower room and toilet as well as laundry, all concealed behind closed doors. Downstairs a spacious bedroom with a queen bed and a third bedroom with a bunk bed and lots of toys, just waiting for children. A generous continental breakfast hamper is supplied for your enjoyment and included in the tariff. Outside the pathways beckon you out to ramble through the forest, or you might sit on the veranda and enjoy a BBQ. A little enchanting scene has been created in the garden where you can sit on wood stools around a fire pit, children will be led to explore the little garden paths. Bird song rings out, and this is about all you will hear from this very peaceful location.